With respect to your position on Apple’s creating this sort of “bypass” for this single iPhone, all while acknowledging this is not a “small threat” for the 100 million iPhones already in existence, you then opined, “There are, however, technology experts who say Apple could create a bypass” “without affecting other phones.” This is your supposed justification for minimizing the threat of putting in a backdoor (or what you euphemistically characterize as a “bypass”) for those 100 million+ iPhones already in existence? Who are these so-called “experts” anyway? Could such a bypass then leak out? It’s possible, but all corporate secrets face that danger. Might the government start knocking on Apple’s door repeatedly, wanting to unlock the devices of other would-be terrorists and high-level criminals? Clearly, it already has. To maintain privacy as much as possible, the government should limit its requests to matters of national security. Could hackers devise a bypass of their own? Some tech experts say that it’s possible and that no one should assume their device is completely protected. Further you state, “Could such a bypass then leak out?” also minimizing that leak threat as something trivial. This gross underestimation of the threat posed by such a leak (which is actually what security researchers say is an intentional “backdoor”) demonstrates your considerable lack of knowledge of cyber security, encryption, hacker and oppressive nation-state threats. Any created vulnerability, or backdoor, is the threat. Such a backdoor would present an attack vector for prying open an iPhone for any purpose and one that would certainly come to pass and likely a within a short amount of time. In fact, one of the top cryptographers, computer security and privacy specialists in the United States, Bruce Schneier, lives in the Twin Cities and he could easily have provided you with knowledge that would have prevented you from embarrassing yourself by so openly demonstrating your technical naiveté when it comes to cyber security. (Here’s a link to a paper which bolsters my argument, Keys Under Doormats: Mandating insecurity by requiring government access to all data and communications (PDF), which was written by an elite group of 14 of the world’s top cryptographers and computer security specialists, who have concluded that the American and British governments demands for special access to encrypted communications cannot happen without putting the world’s most confidential data and critical infrastructure in danger). What is most disturbing about your editorial is how you also provide virtually near-zero context for Apple’s position by, once again, diminishing it: “Apple CEO Tim Cook has become increasingly concerned about customer privacy, particularly after 2013 revelations by whistleblower Edward Snowden about massive government surveillance.” Using the word “concerned” does, once again, trivialize Apple’s position, especially since Snowden’s revelations about the National Security Agency’s vacuum surveillance of communications, social connections, use of facial recognition on photos and other a myriad of other invasive techniques is, for those of us who actually understand what is going on here and abroad, is one of the actual, biggest threats to our Constitution and to liberty itself. In my view the NSA’s possibly illegal—and certainly counter to their non-domestic-spying mandate activities—is what is jeopardizing our national security far more so than one individual terrorist’s iPhone and the FBI trying to cover their mistakes on this one (or using this as a way to get Congress to act on outlawing, or minimizing, the use of encryption). Here’s the dilemma: The safer our smartphones are for us, the safer they are for those who would do this nation harm. Are we willing to provide those individuals or groups a secure means of communication on the most sophisticated portable device the world has known and block national security and law enforcement officials from gaining entry? Fearmongering aside, it is important to remember that we can allow one thing without allowing everything. Forcing government officials to obtain warrants and provide a measure of proof that they have few other options for obtaining needed information are important protections. Those conditions were met here. Terrorist activities pose an ongoing threat to Americans. This latest attack came at a holiday party by county employees, most of whom knew their attacker simply as a co-worker. Within a tested legal framework, a company should be compelled to provide assistance on issues that can help prevent such assaults. Apple has a duty to safeguard both its products and its reputation. It does not have the right to jeopardize the nation’s safety. Creating your backdoor would break encryption and is a disingenuous argument since I know StarTribune editors can read and perform basic research: breaking or weakening encryption would only result in catching the stupid or put the innocent at grave risk from oppressive regimes, while also bolstering those regimes who are waiting to see the outcome of this controversy before demanding Apple do it in their countries as well. As we now know from the Paris newspaper Le Monde, the Paris attack terrorists there used open communications, unlocked phones, and ones easily able to be tracked (i.e., nothing was encrypted) but it didn’t matter, did it? That’s because they either didn’t believe they’d be found-out or they, too, were naive about mass surveillance. Either way, smart-about-surveillance terrorists either use end-to-end encryption, burner phones, dead-drops (of information) or, in the case of Osama Bin Laden, use couriers taking USB flash drives from place-to-place so as to stay off the internet and other potentially-surveilled communications technology altogether. 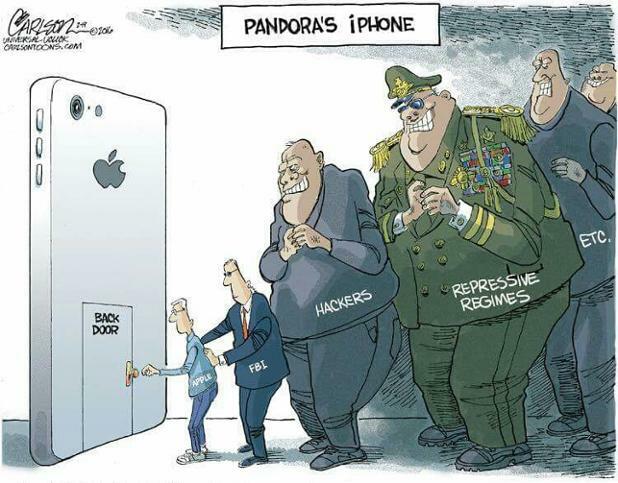 Perhaps Apple’s democratization of encryption is what you’re frightened about and that is your actual position? If so, then shouldn’t you also be up-in-arms about end-to-end encryption of Apple’s voice and video tool FaceTime? Or Apple’s instant messaging which has been encrypted since 2011? Or a highly secure, end-to-end encrypted voice and text app for iOS and Android called Signal? Or locked community forum websites that are accessible only through Tor (i.e., The Onion Router which bounces communication through relay servers, thus hiding the user) so bad guys and others who wish to remain private can communicate with one another shielded from everyone? Or perhaps you advocate forcing Google to remove their new end-to-end, server-level encryption in email (i.e., Gmail) so the NSA can no longer tap lines between Google’s server farms and vacuum up all email traffic? See the slippery slope we’re on and how complicated this issue really is? That’s why I think your editorial position is incredibly naive and not even close to a cogent argument for a major newspaper. Think it through and try again please, this time with an article that is balanced, well researched, and looks at the issue from all sides.